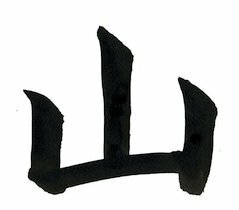 An examination of the kanji symbol for "mountain" from a metaphysical and Filianic perspective. When we research the meaning and symbolism of the kanji for mountain (山 yama), we tend to meet very literalistic interpretations. These have been the fashion in the West in all areas for centuries. In China, non-materialist views are persecuted, and Japan's tradition has not been one of publishing openly but of quietly transmitting traditional data from teacher to pupil. This leaves us with very little traditional data – if by data we mean verbal formulations. However, in terms of symbolic language, which is very fundamental to real human thought and always woven into even spoken language, many kanji are very easily "readable". The idea that verbal abstractions are the closest we can get to describing reality is in itself an error of modern rationalism/materialism. This does not mean that some more verbal explication would not be welcome, but it does mean that in many cases it is very possible to “read” the kanji given even a small knowledge of the universal language of symbolism. One of the first kanji a learner is introduced to is 山 “yama” – mountain. This is interesting in itself because mountains are not the earliest things we need in our vocabulary. But at least the first few kanji follow the traditional Japanese pedagogical order, and introduce some of the most fundamental symbols – the sun, the moon, humanity, fire, water, river, mountain, basic numbers etc. The Sacred Mountain, as we know, is common to most traditions. While to a modern, non-symbolic mind, something like an triangle might be a more “intuitive” symbol for a mountain, the actual kanji beautifully encapsulates all the important points of the symbolism. The important symbolic points about the Sacred Mountain are: its summit, its base, and its slopes. “Earth moves, but heaven is still, the rim revolves but the Center remains without motion”. It is also the head-point of the World Axis. 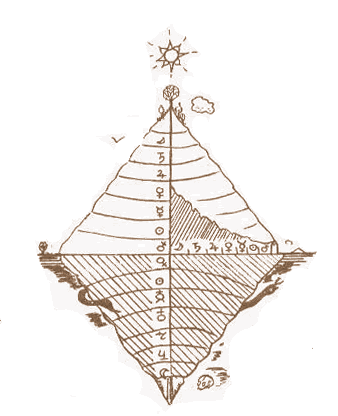 Thus the “core” of the mountain (and also the first stroke drawn) is the single upright – the World-Axis itself. As with the symbol of the cross, the World Axis transects the horizontal plane, which represents our world. Unlike the cross, the mountain is concerned only with the Principle as it relates to our world, and so does not depict what lies below it. Thus from the point of view of the mountain symbolism, the horizontal bar is the base. To round out this picture from a Filianist perspective, some Filianic (non-kanji) depictions show a kind of inverse-mountain underneath the mountain itself through which the pillar descends – its lowest part being the pillar of the Nether World on which the slain Daughter was hanged. The other important point about the Sacred Mountain are its slopes. These represent the various stages of ascent between our world and the Apex. In the symbolism of the ziggurat, various levels are depicted. In the yama kanji only one level stands as an example of all possible levels. The outer verticals could theoretically be of any height. Outside the Principle itself, we are still in the realm of duality (the base of all plurality), thus the level of ascent is mirrored on each side. Again, from a Filianist perspective, the references in Scripture to “following Me upon the Mountain” refer to this path of ascent. Thus the cardinal metaphysical aspects of the Mountain are represented with wonderful simplicity in this kanji. 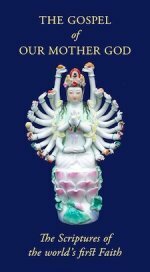 The Sacred Mountain and the Apple : A more general article on the Sacred Mountain in the Faith of Our Mother God. Follow us on Facebook, Twitter or the Chapel Chronicle to stay in touch.